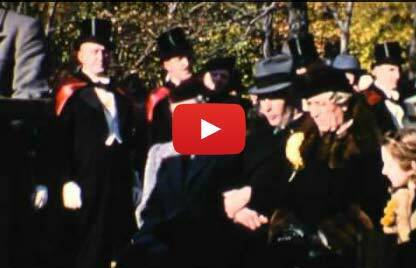 This home movie (CLICK HERE to Watch on YouTube) was taken of the Dedication of the Irish Cultural Garden on October 29, 1939. Some of the speakers and dignitaries can be identified from contemporary newspaper accounts of the dedication. Those included Harold H. Burton (Mayor of Cleveland), John J. O’Malley (Vice President, Irish Cultural Garden Association), the Hon. Frank J. Merrick (Common Pleas Judge), Mrs. Mary K. Duffy (Vice President, Irish Cultural Garden Association), Martin L. Sweeney (U.S. House of Representatives), Rev. S. J. Driscoll (Assistant Pastor, St. Thomas Aquinas Church), and Msgr. John R. Hagan (Diocesan Director of Education). However unidentified members of the Parmadale Band, the Sons and Daughters of Eire, and the West Side Irish-American Club, as well as attendees from the general public can also be seen throughout the short film.